How do Stoic Angel and Dovin Baan Interact? +1: Until your next turn, up to one target creature gets -3/-0 and it's activated abilities can't be activated. -1: You gain 2 life and draw a card. -7: You get an emblem with "Your opponents can't untap more than two permanents on their untap step." 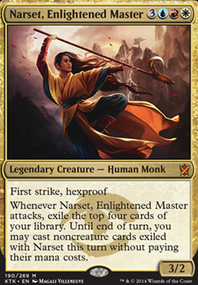 Dovin Baan and Narset Transcendent would be extremely useful adds to this deck, even if Narset is a bit on the expensive side. You pretty have the top two cards considered in your deck already that being Dawn of Hope and Drogskol Reaver . The other cards are pretty subpar with maybe Dovin's Acuity because of the reuseability. I can see that your deck also a bit half and half, but feel free to ask for any advice! Always down to help people fine tune their decks! I mean I guess, but what I said still stands. Glad it works for you, but it might be best to cut the "No Better Deck" portion in the title. Please don't disregard my criticism either. 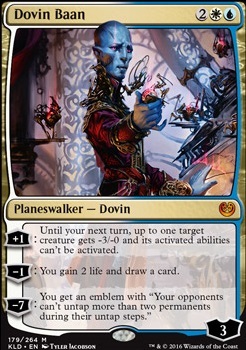 You're excluding lots of other powerful walkers like Dovin Baan , Narset Transcendent , Sorin, Solemn Visitor who can all almost ult immediately with Doubling Season and stax the board with their emblems. 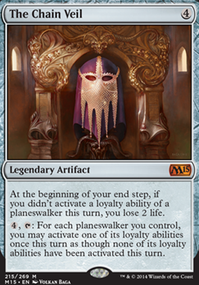 Elspeth, Knight-Errant , Elspeth, Sun's Champion , Nissa, Voice of Zendikar and many others can develop a board of tokens which are just highly valuable especially under Humility . 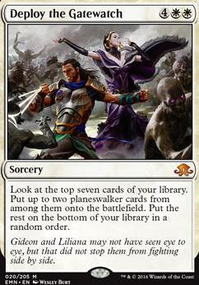 Some of the walkers you run feel really subpar and you're honestly not running enough of them to warrant calling it a superfriends deck in the presence of so many creatures too. Just because you are barely below 3 CMC on average doesn't make it any better than my Atraxa deck running nine more walkers than you at just barely above 3 CMC. 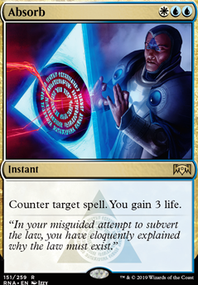 Call of the Gatewatch is bad like the previous commenter stated, and you are going in way too many directions at the moment. You have no place in saying that there is no better deck out there, especially when you are not receptive of the obvious criticism you are getting. I very much advise you to remove that bit of ignorance from the title and description, regardless of whether or not you decide to implement any of this other advice from the comment section. Ajani, Mentor of Heroes only has one relevant ability for your deck, which is outclassed by Ajani Unyielding. He should be an auto include. Will Kenrith seems like he would be outclassed by most planeswalkers. Dovin Baan, Teferi, Hero of Dominaria, anyone. Jace, Unraveler of Secrets and Sorin, Grim Nemesis deserve a spots in the deck, possibly over Ob Nixilis or Vivian Reid. I realize that you have said that you're slowly building the manabase, insinuating that this is on a budget, but if you happen across a Captain Sisay, I would trade for or buy it. Zimmers_0 The planeswalker deck walkers this time are confirmed as Dovin Baan and Domri Rade. So they should both be in the set with normal (more powerful) versions. 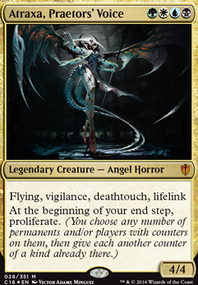 If a player controls a Stoic Angel and then activates Dovin Baan's third ability, how many permanents and what type of permanents will their opponents be able to untap during their untap steps? BTW, just looked up Smh. Either you're right about a mass Discard deck w/ Tibalt running either Olivia, Mobilized for War, or Malfegor, & I'm as Ambitious as I already know; moreso even now, or the fact I'm running would mean something regarding the 4 words; all Keywords. Well, I'm sorry about such a notion, but there probably is worse out there anyway; Hint: Eldrazi Displacer + Riftsweeper. & the deck isn't even .